With speed, efficiency and discretion, FTI Technology provides a strategic, systematic, and economic approach to analyzing, collecting and investigating the full spectrum of modern data sources. Leveraging state-of-the-art forensic technology and methodologies, our experts have years of experience finding and collecting evidence in a defensible manner, with chain of custody intact and minimal disruption to daily business operations. The FTI Technology team can also provide expert testimony and develop courtroom materials that clearly explain the evidence and methodology. 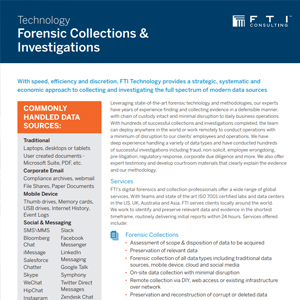 FTI’s digital forensics and collection professionals offer a wide range of global services. 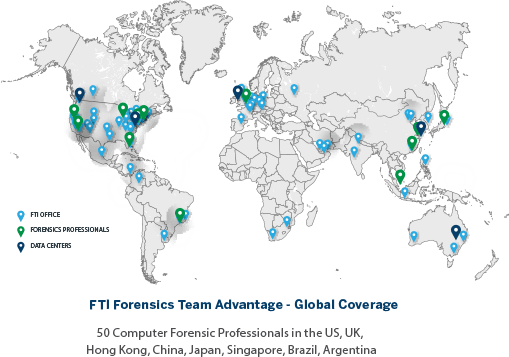 With teams, labs and data centers in the US, UK, Australia and Asia, FTI serves clients locally around the world. FTI Technology’s digital forensics group is highly adept at identifying and untangling webs of interdependencies that link people, corporate entities, monetary amounts, business partners and outsiders to the critical events under analysis. This includes the common threats of data removal, wiping, or deletion, as well as identification of unusual activity, such as unexplained gaps in computer usage, Internet browsing history, use of USB /thumb drives, and file access activities. With hundreds of successful collections and investigations completed, the team can deploy anywhere in the world or work remotely to conduct operations with a minimum of disruption to our clients’ employees and operations. The team has deep experience handling a variety of data types and has conducted hundreds of successful investigations including fraud, non-solicit, employee wrongdoing, pre-litigation, regulatory response, corporate due diligence and more. 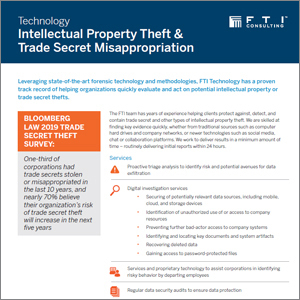 Bloomberg Law 2019 Trade Secret Theft Survey: One-third of corporations had trade secrets stolen or misappropriated in the last 10 years, and nearly 70% believe their organization’s risk of trade secret theft will increase in the next five years. 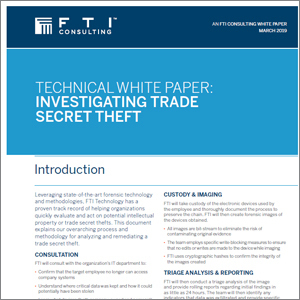 The FTI team has a particularly strong track record in helping corporations protect against, detect, and contain trade secret and other types of intellectual property theft. 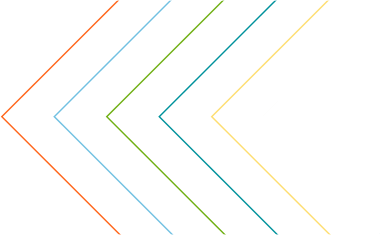 We work to identify risky behavior by departing employees, secure all potentially relevant data sources, recover deleted data, gain access to password-protected files, and find key documents and system artifacts in a minimum amount of time – routinely delivering initial results and reports within 24 hours. Our team can then provide expert testimony about the results of our investigations. The team also works in additional roles around theft investigation, including helping companies that inadvertently receive trade secrets and serving as a neutral third party or court appointed expert to investigate and remediate data theft. From apps such as Gmail and Google Docs to collaboration platforms like Slack to chat applications to popular social media sites including LinkedIn, Twitter and Facebook, the FTI Technology team can quickly collect and preserve cloud data in a defensible manner. Using proven software, tools, and methodologies, FTI Technology enables legal and IT teams to easily search, preserve, collect and review these emerging data types alongside other enterprise information so that they can quickly understand and act upon the content for legal matters, investigations or regulatory responses. The FTI Technology team employs thorough and tested workflows to complete both small and large-scale data remediations. Using an array of data analytics tools, the team can perform a comprehensive identification of problem documents across multiple ESI sources and then quickly remove misappropriated or other unwanted data from company networks. FTI offers an array of services to help software publishers and other organizations analyze the use and misuse of software licenses. From license audits to software piracy investigations to general licensing management, FTI’s global team of recognized experts in digital forensics, licensing compliance and investigations can help corporations monitor and protect these valuable assets. The FTI digital forensics team offers clients deep experience collecting and preserving data during the e-discovery process. From assessment of scope and disposition of data to be acquired, to preservation of relevant electronic evidence, to forensic collection of a full array of data types, to preservation and reconstruction of corrupt or deleted data, the digital forensics team can help. Additionally, the team has worked on email fabrication and alteration matters, testified about authenticity of documents, done deletion analyses from cell phones, email servers and other sources and worked on many other complex e-discovery challenges. Throughout the entire litigation lifecycle—from data collection and culling to review and production for possible presentation in court— the entire FTI Technology team employs proven methodologies that provide a strategic and logistical advantage. Why FTI for Digital Forensics and Investigations? In all scenarios, FTI’s forensic team acts with the utmost speed and efficiency. We know that in many cases, timing is crucial to the preservation of key facts and data. That’s why our professionals work to assess data populations, determine data source types, analyze actions of individuals and preserve evidence rapidly. We then deliver reports on case intelligence within the shortest possible timeline, helping organizations to quickly understand the matter and implement appropriate actions. As a global company, FTI forensic professionals can quickly deploy from our offices across the world to collect relevant data or uncover key facts behind the investigation. Clients benefit from FTI’s extensive experience managing global matters, including adherence to foreign data privacy laws, in-country cultural awareness, discrete processes that do not interrupt the regular course of business and multi-lingual capabilities. FTI forensic professionals utilize defensible tools and methodologies to ensure the collection and investigation is conducted in a forensically sound manner. In addition, FTI can develop courtroom materials that clearly explain the forensic evidence and methodology, including affidavits, file activity diagrams, exhibits, as well as expert testimony. 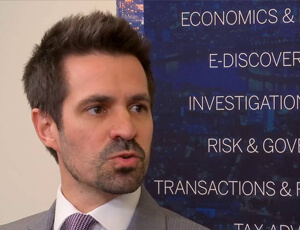 FTI forensic services are tailored to the specific client needs of each matter. Whether a small internal investigation, or a large global matter that may result in litigation, FTI offers a depth of experience in delivering tangible results for clients. In addition to publishing regular whitepapers, industry articles and books, FTI Forensics and Investigations professionals are actively involved with thought leader groups such as The Sedona Conference, EDRM and the e-Disclosure Information Project. With more than 4,600 employees located in most major business centers in the world, we work closely with clients every day to anticipate, illuminate, and overcome complex business challenges in areas such as investigations, litigation, mergers and acquisitions, regulatory issues, reputation management and restructuring.